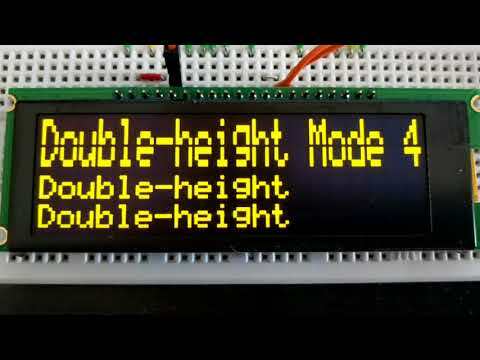 I've written a SPIN object to drive these displays (based on the US2066 controller). They can be interfaced with using I2C (which I've written this for), SPI, as well as a couple different flavors of parallel interface. They're super thin (pic attached next to the FLiP I drove it with), have a great response (they don't have that motion blur/ghosting look that character LCD panels do) and great contrast. It uses one extra cog (for the PASM I2C object - thanks to JonnyMac), although I plan to try a version using a SPIN I2C object so that no extra cogs are used. EDIT: Done - this is up in the repository. Only catch with the SPIN version is that the I2C clock rate can't be specified. It also uses a few objects from the spin-standard-library, also at github (though I've uploaded a zip containing the project as well, so it includes all dependencies). Here is a video (unfortunately the 60fps didn't get preserved during the upload): Never mind - imported it incorrectly the first time. The current upload is 60fps. How many pins are you using? Yes that's the one (just a side note that most of the photos I've seen of the display, that one included, don't very closely represent the font/typeface that's actually stored in the ROM. The one in the video I made shows the embedded font). Interfacing over I2C, it just uses five pins: Vcc, Vss, SCL, SDA (two pins are tied together to form SDA), and RES. I think I remember seeing a Google image search result of what looked like a small breakout/adapter board someone made, that once connected, only brought out the necessary pins for I2C or SPI - might have to dig that one up. Wow, that is an awesomely thin display compared to the regular #27977 LCD panel I have been using on the Stingray! Thanks for sharing your code.